(TORONTO – July 25, 2011) In 2012, the Art Gallery of Ontario (AGO) will present a major survey of masterworks by the most inventive and influential artist of the 20th century, Pablo Picasso. Picasso: Masterpieces from the Musée National Picasso, Paris features more than 150 highlights from the Musée’s unparalleled collection, including paintings, sculptures, prints and drawings. The exhibition will be on view at the AGO from May 1 through August 26, 2012. The collection of the Musée National Picasso, Paris comprises more than 5,000 works that Picasso kept for himself and his family over the course of his career, ranging from informal sketchbooks to iconic masterpieces. Picasso: Masterpieces from the Musée National Picasso, Paris features is touring the world while the Musée undergoes a multi-year renovation, scheduled for completion in 2012. The AGO is the sole Canadian and final venue on the tour, which includes stops in Madrid, Abu Dhabi, Tokyo, Helsinki, Moscow and St. Petersburg, Seattle, Richmond, San Francisco and Sydney. The exhibition also highlights Picasso’s depictions of his numerous muses and mistresses, including 1918’s Portrait of Olga in an Armchair, which features the Russian ballerina and Picasso’s first wife seated on a Spanish tapestry, the background left purposefully unfinished. 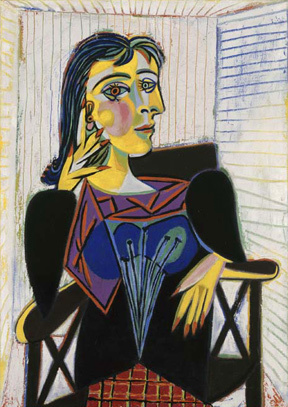 French surrealist photographer Dora Maar, who inspired his 1937 “Weeping Woman” series, is also prominently featured, as is Jacqueline Roque, Picasso’s second wife and most-painted muse, depicted in the 1954 work Jacqueline with Crossed Hands. AGO members will be invited to an exclusive advance preview of Picasso: Masterpieces from the Musée National Picasso, Paris in the days leading up to the exhibition’s public opening. As with Abstract Expressionist New York: Masterpieces from The Museum of Modern Art and Chagall and the Russian Avant-Garde: Masterpieces from the Centre Pompidou, Paris, AGO Members receive free admission and VIP access to the exhibition, among other discounts and benefits. More information on AGO membership can be found at www.ago.net/general-membership. A 296-page catalogue has been published to accompany the exhibition. Edited by Anne Baldassari, Picasso: Masterpieces from the Musée National Picasso, Paris includes 194 illustrations and will be available for purchase at shopAGO. Picasso: Masterpieces from the Musée National Picasso, Paris is curated by Anne Baldassari, chairman and chief curator of collections of the Musée National Picasso, Paris. Elizabeth Smith, the AGO’s executive director of curatorial affairs, will oversee the exhibition’s installation at the AGO. The exhibition is co-organized by the Musée National Picasso, Paris and the Art Gallery of Ontario. Lead Sponsor BMO Financial Group. Additional support is provided by Air Canada, Official Airline for the exhibition.